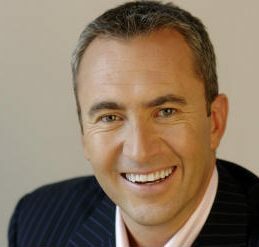 Mark Beretta is Australia’s most watched Sports Presenter. He is also an author, engineer, 10-times Australian water ski champion, Dancing With The Stars contestant, and marathon bike rider. As sports guru for the Seven Network’s Sunrise program, he has been watched by almost half a million Australians every day. Highly regarded amongst sport presenters and commentators, Mark has covered almost every major international event over 20 years in sports journalism. A vibrant personality with the ability to make guests feel immediately at ease in his company, Mark Beretta is in high demand as a corporate host and MC. In 1994, Mark joined Channel Ten to commentate and report for its National Basketball League coverage. His work impressed executives at Seven Melbourne and within a year, he was working as a sports reporter for the Seven Network. A veteran of five Olympic Games broadcasts, Mark was one of the anchors for Seven’s award winning coverage of the 2000 Games in Sydney. He also co-anchored Follow The Flame, the live coverage of the final week of the Olympic Torch Relay, watched by millions of Australians. Mark was a member of Seven’s distinguished AFL commentary team. He has also hosted the World Cup Aerials, the Moomba Masters, the Kellogg’s Surf League, and Seven’s Winter Sport Series. He was behind the microphone when Alisa Camplin captured gold in the Freestyle Aerials at the 2002 Olympic Winter Games in Salt Lake City. Other highlights include hosting Seven’s telecast during Cathy Freeman’s 400 metres Gold in Sydney, working with Greg Norman to host the arrival of the Olympic Flame in Sydney, and being poolside for Kieren Perkin’s Gold medal swim at Atlanta in the 1500m freestyle. Mark was also the MC at Buckingham Palace for the launch of The Queen’s Baton Relay for the Gold Coast Commonwealth Games. Mark is a familiar motorsports broadcaster. He has commentated the Bathurst 24 Hour Race, the Australian Super Touring Car Championships and is part of the Seven Network’s coverage of the V8 Supercar series, where he provides updates from down on the race track and in pit lane during race coverage. He also hosts Seven’s weekly V8’s show V8’s Xtra. Prior to joining Australia’s Number 1 Breakfast show, Mark was the Sports Anchor on Seven News, where alongside Ian Ross, Seven News rose to be Sydney’s most watched News service. Mark also spent two years as co-anchor of Sunrise with Georgie Gardner. He also regularly reports for the top rating lifestyle program, Sydney Weekender. Understandably Mark’s interests include water-skiing. He also enjoys running, golf, tennis and flying. Mark is a keen supporter of the Geelong Football Club. Mark Beretta also works with the Children’s Cancer Institute. An Engineer, he has worked with BHP and Honeywell.